As a discussion with its CFO helped drive home, Red Hat (RHT - Get Report) is still well-positioned to profit from some major enterprise tech trends. Nonetheless, Wall Street has been in a pretty unforgiving mood after the open-source software giant disclosed weaker-than-expected billings and guidance numbers through its latest earnings report on Thursday after the close. And that might serve as a cautionary tale for other enterprise software names that have rocketed higher over the last 12-to-18 months with the help of positive earnings news. After the bell on Thursday, Red Hat reported above-consensus sales and EPS for its May quarter, but also reported quarterly billings of $709 million, which was below a $721 million consensus. In addition, the open-source software giant issued below-consensus August quarter sales guidance and offered mixed fiscal 2019 (ends in Feb. 2019) guidance. EPS guidance was slightly raised, but revenue guidance was lowered to a range of $3.375 billion to $3.41 billion (implies 16% growth at the midpoint) from a prior outlook of $3.425 billion to $3.460 billion. Red Hat also unveiled a new $1 billion stock buyback program, which replaced a prior $1 billion program that had $249 million remaining. Management stressed that the revenue guidance cut was only due to forex swings (the dollar has strengthened in recent months). However, with Red Hat having issued above-consensus full-year sales guidance in its previous five earnings reports, and with its stock having risen close to 70% in the 12 months prior to earnings, markets wanted something more. Red Hat's shares fell over 14% in Friday trading, hitting their lowest levels since early April. Some other software high-flyers were also hit. Pivotal Software (PVTL , whose cloud app platform (PaaS) offerings, compete against Red Hat's, fell over 5%. Some firms with little or no product overlap with Red Hat, such as Splunk (SPLK - Get Report) and Smartsheet (SMAR , also saw big drops. Getting a lot of attention from analysts during Red Hat's earnings call: Slower growth for sales of middleware (software used to glue together various apps and services). Red Hat has blamed this slowdown on a transition among clients from traditional middleware offerings to newer products that work with apps running inside of containers managed by the company's OpenShift PaaS platform. However, on the call, the company indicated that traditional middleware rivals IBM (IBM - Get Report) (also a Red Hat partner) and Oracle (ORCL - Get Report) have been pricing aggressively in some fields. "Both IBM and Oracle have started giving 98% discounts or whatever it takes" to hold onto business, said CEO Jim Whitehurst on the earnings call. Likewise, when asked by TheStreet on Friday about price pressure, CFO Eric Shander said "the whole marketplace has become extremely competitive," as traditional vendors try to maintain their positions. He also suggested that the transition faced by Red Hat's middleware business will take several quarters, as clients deal with "big technical decisions" about how to implement more modern app environments. However, Shander asserted Red Hat's middleware business remains well-positioned competitively as clients migrate to container-centric environments. He added that Red Hat has "thousands of middleware customers we're talking to" about adopting more modern solutions, including ones involving OpenShift. 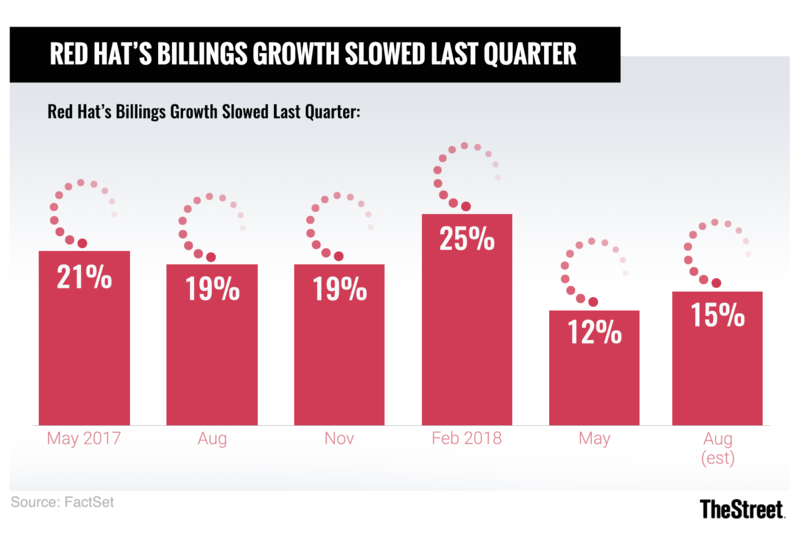 When asked about the slowdown in Red Hat's billings growth, Shander stressed that his company doesn't issue billings guidance on the grounds that it can fluctuate a lot based on deal timings. "We don't want to be driving our sales teams by billings," he added, arguing that if it did, salespeople would feel pressure to offer discounts in order to hit quarterly targets. In addition to OpenShift, Shander was upbeat about adoption of Red Hat Enterprise Linux (RHEL) within public cloud environments such as Amazon (AMZN - Get Report) Web Services (AWS) and Microsoft (MSFT - Get Report) Azure. He reiterated that revenue stemming from Red Hat's CCSP program, through which cloud providers provide Red Hat Enterprise Linux (RHEL) to clients, hit a $200 million run rate last year, and added that the business is still growing twice as fast as Red Hat overall. Shander also noted many enterprises use Red Hat's Cloud Access program to deploy existing RHEL subscriptions within cloud environments. Though declining to share specifics, he stated survey data pointed to a lot of public cloud use through the program. When asked about the recent expansion of Red Hat's partnership with IBM -- it involves the pairing of RHEL and OpenShift with IBM's private cloud, middleware and database offerings -- Shander sounded pleased about the speed at which IBM and Red Hat's teams have been working to roll out joint solutions. However, he cautioned that the deal isn't expected to have a meaningful impact on Red Hat's top line until near the end of fiscal 2019. On the subject of buybacks, Shander suggested Red Hat won't be shy about putting its new $1 billion buyback authorization to use in the near-term. But he also suggested Red Hat's post-earnings selloff won't influence its decision-making. "We still feel like the stock is a good investment...we don't try to time the market," he said. It could take a little while for Red Hat's shares to settle down, given investor disappointment over its billings/guidance and the big run-up the stock had previously seen. And certainly, for investors in other software names that have run up sharply, Red Hat's post-earnings swoon should act as a reminder that these companies now have a limited margin of error. On the flip side, Linux, container and cloud adoption all remain long-term growth drivers from Red Hat (even if meaningful competition exists), as does the broader adoption of open-source solutions by enterprises. With Red Hat now sporting an enterprise value (market cap minus net cash) equal to 20 times its expected fiscal 2020 free cash flow (FCF), its valuation still isn't exactly cheap, but it's not exorbitant either.